The Northern Ireland Assembly spent more than £250,000 subsidising its restaurant, café and MLAs' dining room during 2012. The total subsidy, £266,368, was more than £30,000 less than the corresponding figure for 2011, which was £302,498. The figures were provided by the Stormont Commission, which runs Parliament Buildings. This was in response to questions from BBC Radio Ulster's Nolan Show. An assembly spokeswoman told the Nolan Show on Tuesday that the latest Stormont catering contract was awarded in July 2012. "Due to the nature of assembly business and the requirement that services often be provided during unsocial sitting hours and for events, the costs of providing such services exceeds the monies taken in (and)... the extra cost is assumed by the assembly." The spokeswoman said the catering contract was "continually under review to provide the best value for money". Former Alliance MLA Seamus Close said the nature of the operation at Stormont meant some degree of subsidy was required. But Mr Close told BBC Radio Ulster that spending more than £1m in three years could not be justified. He said he was totally opposed to selling meals at "less than the going rate" and it was wrong to "have the less well off in our society paying the better off to have their meals at a cheaper price". TUV leader Jim Allister told the Nolan Show the subsidy amounted to about £1,000 per day. The North Antrim MLA described it as "outrageous" and said efforts to reduce the subsidy had not gone far enough. He suggested Stormont was trying to maintain too many outlets within Parliament Buildings. The general manager of Belfast's Whites Tavern, Kris Nixon, said he felt disgusted to hear about the subsidy when he was struggling to pay his restaurant's rates and bills. However, former DUP MLA Wilson Clyde pointed out that any sudden removal of the subsidy would only put those employed on the catering contract out of work. So far in 2013, the Stormont food subsidy has amounted to £116,281. However, Parliament Buildings is not the only place in Northern Ireland with a subsidised canteen. BBC Northern Ireland told the Nolan Show that their projected canteen subsidy in Belfast's Broadcasting House for 2013/14 will be £47,000. That will represent a reduction of 25% over the last 12 months. A BBC Northern Ireland spokesman said the current subsidy was "based on the service that will be provided across our different sites in Belfast and includes provision for opening hours that reflect the nature of the BBC's work". 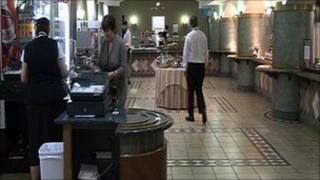 However, the BBC said its policy was "to move towards a zero-BBC subsidy on canteen costs".